The FSF is happy to building bridges to new communities, and exploring the role of free software in social justice and economic change. FSF campaigns manager Zak Rogoff (left) with René Pérez of the New Economy Coalition. 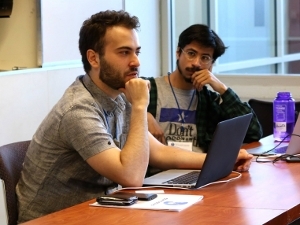 Last month, FSF campaigns manager Zak Rogoff attended CommonBound, a Boston conference for those working towards a more equitable and sustainable economy. Zak joined René Pérez of the New Economy Coalition on the panel "Opening access to the digital means of production: free software for a more equitable economy." The panel featured an exploration of existing and proposed free software business models, as well as a discussion with participants of varying free software experience, from seasoned hackers to economic justice activists discovering the four freedoms for the first time. No matter where you are on the political spectrum, free software is important to achieve political autonomy. The FSF is happy to be building bridges to new communities, and exploring the role of free software in social justice and economic change. We look forward to sharing skills and ideas with diverse allies as we continue to foster an inclusive free software community. If you're interested in a conference experience focused on free software, check out LibrePlanet, the FSF's weekend-long event next spring, and sign up for updates on LibrePlanet 2015. We'd also be glad to speak at your event if we can make the trip. Send us an email at campaigns@fsf.org to get the conversation started. We also encourage supporters to give talks and host events in their communities. Check out our resources area if you'd like to get started with free software outreach.